The Village of Barovia is easily the grimmest place in Barovia. Castle Ravenloft is ever looking down upon them. The mists are thicker here. The village is isolated from the other places in the valley by either forest or mountains. And just recently, Count Strahd has been paying visits to the town; trying to seduce Ireena Kolyana and eventually take her away to the castle. Other than his personal visits, wolves, bats and other creatures of the night have come to attack the village more often than usual. There is no wall or protection for the townsfolk here. The last weeks these creatures of the night have assaulted the Burgomaster’s Mansion (page 44) at night. Kolyan Indirovich’s heart couldn’t stand the constant pressure, meeting his demise three days ago. People in town know that Ireena is Strahd’s pray and no one will step in his way. She and her brother Ismark are alone in this situation. If you didn’t use the Death House intro adventure, the first thing the adventurers will encounter is the Mad Mary hook (page 44). If your group finished the Death House, they will be pretty low on resources and weak. After the mists recede they will be in the middle of the Village of Barovia. It’s important to note that the town’s population has severely dwindled over the years. Having most people move to Vallaki. As a result, many homes are abandoned. If the PCs try to look for an empty house to hide and rest, they might get into further trouble, since some houses are inhabited by swarms of rats or Strahd zombies. As seen in the table in page 41. You can drop the Mad Mary encounter here, the woman is looking for her teenage daughter Gertruda, who escaped a week ago. No one has seen her. This is a quest that will take a LONG time to be completed. Gertruda is a charmed guest of Strahd, she can be found in area k42 (page 68), she is actually in Strahd’s bed. Mary is holding a malformed creepy doll this is the first encounter with a Blinsky toy and his slogan “Is no fun, is no Blinsky”. Since adventurers might be weak, there’s a possibility they will dismiss this hook and continue looking for a place to rest, in that case. You can let them reach the Blood of the Vine Tavern (page 43) and have Ismark tell the tale of poor Mary. This particularly abusive character will charge 10 times the regular price of items in his store. If he has trouble with pesky adventurers, he can call on his nephew Parriwimple who is ripped like a bodybuilder but dumb as he comes. I have seen parties go in very different ways here. Your party might comply and pay the high prices. Other players might choose the sneaky way into the store at night and take what they need. Or others might pick a fight and end up killing someone or burning the store. Don’t fear characters destroying the place up, this module lends itself to this stuff a lot. 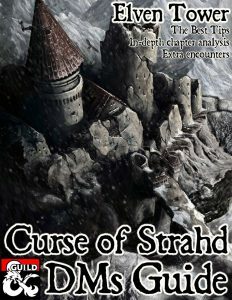 In the end, even Strahd himself can arrive and intervene if a group of murder-hobos are killing off his subjects. He is after all the rightful lord of this land. The tavern owners, three Vistani are there to make sure people pay their tabs. There’s also a barkeep who keeps his mouth shut. Other than that the only important person in the room is Ismark Kolyanovich, he’s the son of the burgomaster and in theory the new Burgomaster because his father is dead. However he has not done anything about that. His only priority is his sister’s welfare. He’s an able swordsman and wants to take Ireena to Vallaki. He’s heard that they have a wall and that the burgomaster of Vallaki keeps the town safe (not really true). He will approach travelers and pay for their food and drinks. He has to, no one in town will help him bury his father or move Ireena out of the village. There are two important things that he doesn’t know: He doesn’t know why Strahd is obsessed with Ireena. And he doesn’t know that Ireena is not his sister. She was adopted by Kolyan when she was really young. The only way to know this in Curse of Strahd is if the adventurers found the letter in the Svalich Woods (page 32). Kolyan explains this fact in his letter. The only other person who knows is Father Donavich (page 46). Also if you used the “Plea for help” hook to start the module. Ismark can confirm that the letter is false. It’s not his father’s handwriting. Ismark and Ireena have reinforced the house after the repeated attacks by monsters. It’s a soft bunker of sorts. Ireena will not open the door unless PCs gain her trust or they come accompanied by Ismark. The body of Kolyan the burgomaster is in the house. Ireena will not willingly abandon the village until the burgomaster is laid to rest in the village’s graveyard, next to the church. Ireena is one of the key elements in Curse of Strahd. She was actually born in Vallaki. Her brother is Izek Strazni, a fiendish thug under Burgomaster Vallakovich’s wing. Neither of them know this. She was also born with the soul of Tatyana Federovna, who Strahd has tried to wed and keep for himself for centuries unsuccessfully. She reincarnates again every so many years and Strahd has failed to achieve his goal so far. This is his new opportunity and he will do all in his power not to fail again. Ireena ignores all this, the only way for her to awaken her lost memories is by visiting the Pool and Shrine in Krezk (page 146). However she does have Tatyana’s spirit and resolve. That’s what the book says but this is a great opportunity for you to decide what will Ireena’s role be. Is she going to be a scared woman, fighting for her life. Or will she be a strong woman doing what she must to survive. Will she be a damsel in distress or a strong feminine icon opposing Strahd. Ireena has many different possibilities. You’d do well in considering your group’s inclinations and intent in Barovia to choose the best role model for Ireena to be. It’s easier for Ismark, he’s the ever loyal bodyguard. This section of town is another spoonful of how grim Barovia is. A recurring story told around is what happened a year ago. 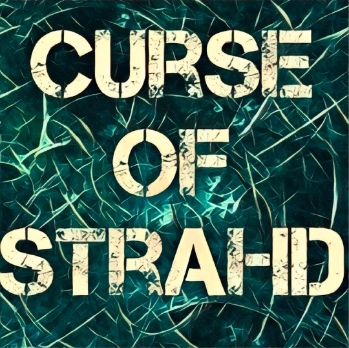 A powerful wizard whose name is forgotten (it’s actually Mordenkainen) led a group of people to fight Strahd and failed miserably. One of these people was Doru, the priest’s son in the Village of Barovia, who came back a vampire. Father Donavich trapped the poor lad in the church’s basement. He’s been there for a year, unfed. He is screaming all the time and he’s the reason why no one ever visits the church anymore. Father Donavich prays every day so the gods give him a way to reverse his son’s transformation. So far he has nothing to offer. He will try to protect his son, even as he is undead. If the adventurer’s destroy Doru, his father will crumble weeping, overcome with despair. Warning.- this vampire spawn can prove a mighty foe for a level 3 party. Even alone, as he can bite and regain HP and most attacks will only do half damage to him. Also this will be the first vampire the PCs face. Fast forward to Vallaki, they will fight 6 at the same time in the Coffin Maker’s Shop (page 116). After the burgomaster’s burial. Father Donavich suggests that they move Ireena as far away from Castle Ravenloft. If possible to the Abbey of Saint Markovia in Krezk, where the abbot can shelter her. Morgantha is a night hag and a coven member. She lives in the windmill, Old Bonegrinder (page 125). She can be seen selling dream pastries for 1 gp and taking a little child as payment. Adventurers will probably confront her, she releases the child and can offer some information in exchange for her life. The two important bits here are that Strahd has undead enemies, the knights of the Order of the Silver Dragon who live in a ruined mansion west of Vallaki. And also that there is a hidden temple, which is the source of Strahd’s powers. She reveals that this temple can be reached by following the Tsolenka Pass. This is very valuable information, not many know this. If the PCs insist on attacking Morgantha, my advice is to Fireball them (not possible according to coven rules) to show them a bit of the hags power. It’s important they fear them when they approach Old Bonegrinder. If you wish to go by the rules, she can always Plane Shift out of reach. After these events. The PCs will probably be accompanied by Ismark and Ireena, and will start their way to Vallaki. If the PCS decide to visit Madam Eva in the Tser Pool Camp it will take them 2 hours to get there and another 4 to reach Vallaki.